It doesn’t matter whether you’ve got a supercar or supermini budget for your next vehicle when it comes to tech. There are cars at both ends of the spectrum that come loaded with gizmos and gadgetry. One of the pieces of kit people are most interested in these days is Apple CarPlay connectivity. Jump to our full list of cars with Apple CarPlay. Apple CarPlay allows you to easily connect your iPhone to your car’s infotainment system and safely access a range of apps while driving. Apple CarPlay is available on all iPhone 5 and later models, provided they have at least iOS 7.1. It uses a simplified iOS-like interface. If you have an iPhone 5 or later, and your car features Apple CarPlay, you’re good to go. All you need to do is plug your phone in via the USB port (CarPlay may be available via Bluetooth or WiFi in the future). 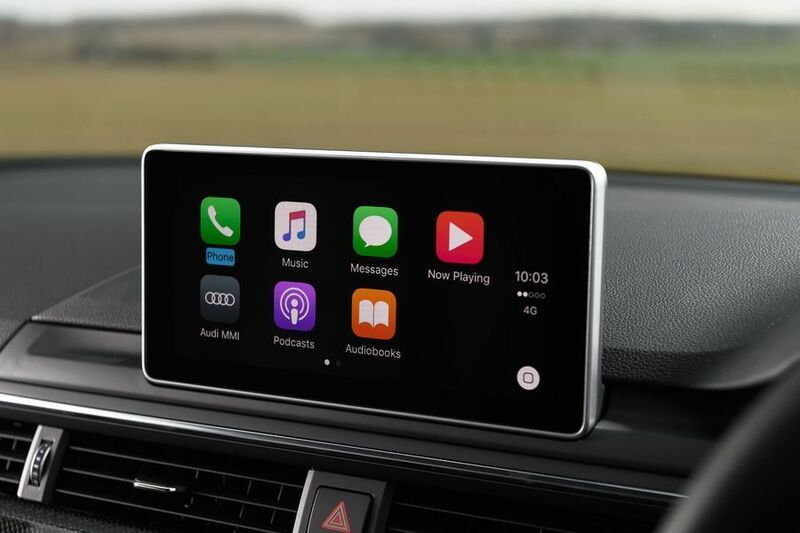 Apple CarPlay gives access to Maps, phone functions, messages, and music, as well as other apps including Spotify, Podcasts, Audiobooks, and apps developed by car manufacturers. It can be controlled via Siri by pressing and holding the voice control button on the steering wheel – so you can keep your eyes on the road and hands on the wheel – via the touchscreen, or by using the various knobs, dials and buttons in the car. Apple Maps can now show turn-by-turn navigation in a car’s instrument cluster (although we are yet to see this in any of the cars we’ve tested), as well as suggesting landmarks on a route, predicted traffic, and suggesting a new route. If your car doesn’t have a built-in infotainment system or Apple CarPlay, you can buy and install an Apple CarPlay stereo. Leading brands include Pioneer, KENWOOD, Alpine, Sony, JVC and Clarion. Some Apple CarPlay apps are built-in, and some you have to download from third parties. All these apps have been optimised for use when driving, meaning you’ll spend as little time as possible interacting with them. In the past, you could only access Apple Maps through CarPlay, but this has recently changed. You can also now use Google Maps and Waze. Having this essentially gets you full sat-nav functionality. The bonus of having online maps is that it will be constantly up-to-date and accurate. However, maps accessed through your phone rely on your iPhone’s network coverage and data, or WiFi to update your location when you’re on the move. If you lose signal, you’ll have to find it again before your map updates. Here’s a full list of all UK cars with Apple CarPlay included. We keep this list regularly updated, but if you want to ask up about a specific model, get in touch on Twitter or Facebook.